The combination of the volumetric flow rates QΔP and Qsonar from the differential pressure based flowmeter 114 and sonar based flowmeter 116 provide a measure of both the flow rate and the wetness of a gas continuous flow 104, which can be determined by the signal processor 134 using the equations: Using the volumetric flow rate of the wet gas flow 104 determined by the differential pressure based flowmeter 114 (QΔP) and the volumetric flow rate of the gas flow 104 determined by the sonar based flowmeter 116 (Qsonar) the signal processor 134 can determine the wetness, the volumetric flow rate of the gas portion, and the volumetric flow rate a the liquid portion of the flow 104. While the present invention defines the outputs of the DP flowmeter 114 and the sonar flowmeter 116 as a respective formula to be solved, it will be appreciated that the data may be provided in the form of a look-up table to provide a number for a non-dimensional parameter (e.g., LM number, MR), the volumetric liquid flow rate and volumetric gas flow rate of the flow 104 in response to the measured parameters (velocity, volumetric flow) of the flowmeters 114, 116. While the description for the sonar flowmeter 116 provides an output signal representative of the velocity or volumetric flow rate of the gas to be used in the determination of the wetness, the invention contemplates that any other output of the sonar flowmeter 116, which is insensitive to wetness may be used to determine the wetness of the gas. The signal processor 134 may output the LM number, the volumetric flow rates QΔP and/or Qsonar, velocity of the gas and liquid portions, or any combination thereof, as well as various other parameters that may be determined from these values as a signal 138. While the sonar based flowmeter 116 is shown as including four pressure sensors 118, it is contemplated that the array 132 of pressure sensors 118 may include two or more pressure sensors 118, each providing a pressure signal P(t) indicative of unsteady pressure within the pipe 124 at a corresponding axial location X of the pipe 124. They are typically used in strain gauges, piezoelectric vibration sensors and accelerometers. It depends of the types of strain gauge and the application place. While the illustration depicts the sonar flowmeter 402 disposed between the pressure sensors 404, 406, the invention is not so limited and the sonar meter 402 may be disposed upstream or downstream of the pair of pressure sensors 404, 406, at any position provided the flowmeter 402 and sensors 404, 406 are not spaced apart so far that the wet gas flow sensed by the sensors is materially different between flowmeter 402 and sensors 404 and 406. 4, the relationship (difference) 410 of the flow rate 414 of the sonar meter 402 and the flow rate 412 determined using the pressure drop between the pressure sensors 404 and 406 may be used to determine the wetness of the mixture (multiphase flow), similar to that discussed hereinbefore. It should be appreciated that the sonar flowmeter 116 may comprise a plurality of ultrasonic sensors 118 to provide an output signal, for example a velocity measurement. While the description for the sonar flowmeter 116 provides an output signal representative of the velocity or flow rate of the gas to be used in the determination of the wetness, the invention contemplates that any other output of the sonar meter 116, which is insensitive to wetness, may be used to determine the wetness of the gas. It should be appreciated that a calibration point can be added by equating the outputs of the differential pressure based flowmeter 114 and sonar based flowmeter 116 during flow conditions where the gas is known to be dry. In contrast, the sonar based volumetric flowmeter 116 has been demonstrated to accurately report a volumetric flow of a wet gas mixture with little sensitivity to wetness. The sonar based flowmeter 116 may include 2, 3, 4, 5, 6, 7, 8, 9, 10, 11, 12, 13, 14, 15, 16, 17, 18, 19, 20, 21, 22, 23, or 24 pressure sensors 118. 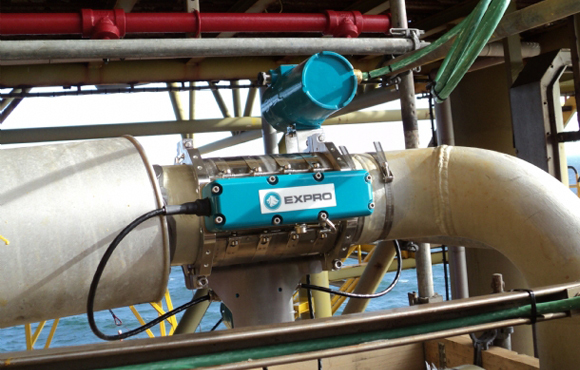 The sonar based flowmeter 116 includes a spatial array 132 of at least two pressure sensors 118 disposed at different axial locations x1 xN along the pipe 124. The apparatus 112 includes a differential pressure based flowmeter 114 (DP flowmeter) and a flowmeter 116 having an array of sensors 118 (sonar flowmeter). In the processing of the combined data (i.e. data obtained from the DP flowmeter and the sonar flowmeter) a set of local wetness sensitivity coefficients for each wetness series (at fixed pressure and flow rate) can be used to provide a more accurate characterization for both the DP flowmeter and the sonar flowmeter to determine wetness, wherein the wetness sensitivity coefficients for each device may be provided by a low order polynomial fit of the over-report vs. wetness. The apparatus of claim 1, wherein the second and first pressure sensors are sensitive to the wetness of the gas flow and the sonar based flowmeter is relatively insensitive to the wetness of the gas flow, relative to one another. While the illustration depicts the sonar flowmeter 402 disposed between the pressure sensors 404, 406, the invention is not so limited and the sonar meter 402 may be disposed upstream or downstream of the pair of pressure sensors 404, 406, at any position provided the flowmeter 402 and sensors 404, 406 are not spaced apart so far that the wet gas flow sensed by the sensors is materially different between flowmeter 402 and sensors 404 and 406. 4, the relationship (difference) 410 of the flow rate 414 of the sonar meter 402 and the flow rate 412 determined using the pressure drop between the pressure sensors 404 and 406 may be used to determine the wetness of the mixture (multiphase flow), similar to that discussed hereinbefore.